Riddled with rhymes and rapt with wordplay, this deck of Knowledge Cards offers 48 enigmas that function as a brain gym in a box. With science revealing cognitive exercise to be as necessary and life-enhancing as physical exertion, poet and educator Emmanuel Williams (the author of Man Without Bones: Riddles from the Oral Tradition) created this collection of conundrums guaranteed to get your gray matter in gear. Using metaphor, simile, repetition, and rhyme, the cards fronts describe everyday items in imaginative verses. 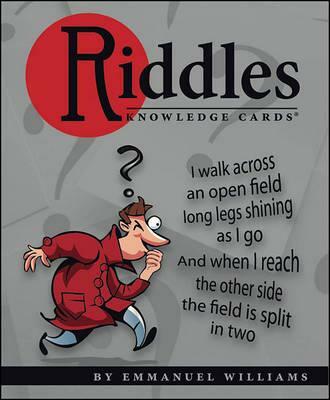 Roll the clues around in your inner ear or voice them aloud to a crowd: either way, solving Riddles (answers are provided on the backs of the cards) will unwind your mind and stretch your imagination. We wish you good luck and good health!